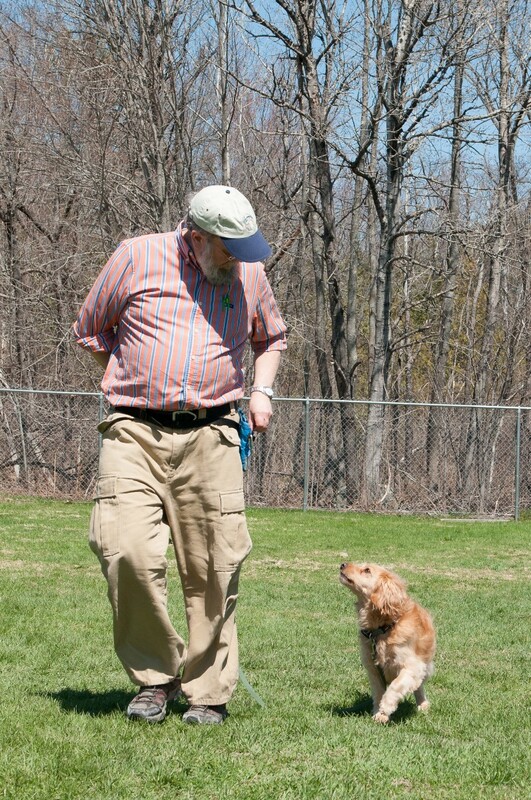 Don and Muppy practicing walking politely off-leash. If you are like most people, you got a dog for companionship. Companions hang out together and training your dog makes that easier. February is Responsible Pet Owners month, and one of the most conscientious things any dog owner can do is to take the time to appropriately train their dog. Odds are if you train your dog they will be able to do more with you and will be welcome more places you would like to take them. Even your friends and family that don’t like dogs, and yes those people exist, will perhaps at least tolerate your well trained, well behaved, magnificent dog. An untrained dog is likely to result in you, and possibly other family members, becoming frustrated. This results in a dog that also becomes frustrated and unhappy. A vicious cycle ensues and opportunities for you to teach and for the dog to learn cease to exist because you are both so wound-up. The time for effective training is well before the bad stuff happens! There are many advantages to having a trained dog. Trained dogs are often welcome at family and neighborhood gatherings, they are less likely to bite someone, and having a trained dog could very well end up getting you a lower insurance rate. Your veterinarian will likewise be very appreciative when you and your dog come in for a checkup and your dog shows off its skills, resulting in an easier visit for everyone. Lastly, when you truly understand your dog and have taken the time to train them; you are both more fun to be with! Really! Unfortunately the actual training of your dog is beyond the scope of this column however, the following are some suggestions on getting started. One option is to train your dog yourself, but you must first be well prepared with some basic information about your dog. A dog is a complex, living, sentient being very different than a human. Dogs do not come with a comprehensive user’s manual that covers everything you really need to know; what were they bred for, how they learn, what normal and abnormal behaviors look like, how they communicate and express emotions, etc. Yet we need this kind of information to make sure that we are meeting our dogs most basic needs; they need far more than food, water, shelter and a human that appreciates them. This is all essential knowledge to having a fantastic relationship with a dog. Learning what you need to know about your dog does not happen overnight. The following books are some recommendations that will serve as a good starter; On Talking Terms with Dogs: Calming Signals by Turid Rugaas , The Other End of the Leash by Patricia McConnell, PhD, DOGS: A Startling New Understanding of Canine Origin, Behavior and Evolution by Raymond and Lorna Coppinger, Dog Sense: How the New Science of Dog Behavior Can Make You A Better Friend to Your Pet by John Bradshaw, For the Love of A Dog – by Patricia McConnell, PhD, and Living with Kids and Dogs…Without Losing Your Mind: A Parent’s Guide to Controlling the Chaos by Colleen Pelar. Beware of information on the internet; as State Farm insurance has so graciously taught us; just because it’s on the internet does mean it is true or good advice. That holds true for the information from dear old Uncle Tim, your neighbor who considers training to be “yelling at the dog” and even some pet professionals, dog breeders and rescues. When you are reading and gathering information about dogs, please remember that not all of the information out there in the world is accurate or humane; it is your responsibility to be a critical thinker. If you do not have the time or would simply rather not do all that reading and studying about dogs, your best bet is to contact a professional dog trainer who will be skilled not only at training dogs but also at teaching you. This part is absolutely critical! Be very wary of trainers that want to work with your dog alone and insist that they can do most of the work for you. That may sound appealing, but if you really want to be companions with your dog you need to be intimately involved with the process. Whether you choose group classes or private instruction, a professional trainer will be able to not only show you what to do but will be able to troubleshoot situations as they arise. I’ve asked books and YouTube videos questions but have yet to get an answer. When looking for a professional dog trainer you want to make sure to select one that has kept current in the field. The best place to start is at the Certification Council for Professional Dog Trainers (www.ccpdt.org) or the International Association of Animal Behavior Consultants (www.iaabc.org). Professionals credentialed by these organizations must not only take a test and comply with a professional standard; they must acquire continuing education units in order to maintain their certifications. So get studying or find a trainer and have fun! Dr. Mark Hanks from Kindred Spirits Veterinary Clinic has been a frequent guest on The Woof Meow Show, giving Kate and I several opportunities to “pick his brain” about a wide variety of topics. For quite some time he’s been asking to “host” the show and to turn the tables so to speak; interviewing Kate and I and asking us questions about animal behavior and training. 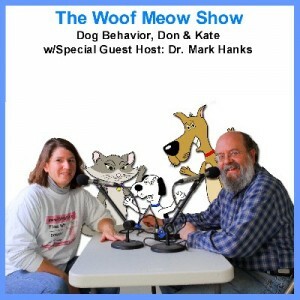 In the first of four shows in this series, Dr. Hanks interviews Don and Kate about their experiences as professional animal behavior counselors and dog trainers. Some of the questions Mark asks are: 1) How did you get into helping people with animal behavior problems? and 2) What does the current science say about dominance and alpha dogs? You can listen others episodes in this series at the links below.